With its traditional style and warm feel, a wood office desk can bring any office to life. Get this timeless style for yourself with a wood office desk for ROF. Because we offer new and used desks, you’re sure to find the wood office desk or desks in your price range. However, all our furniture is manufactured by top brands and then inspected by us to ensure quality and craftsmanship. Whether you’re looking for a mahogany, L-shaped wood office desk or an oak, right return model, we’re sure to have what you need. Plus, even if you don’t know what you want, our helpful salespeople can assist you in narrowing down your possibilities to help you figure out what suits you best. 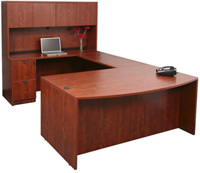 Get the best prices, service, and quality with a wood office desk from Reimagine Office Furnishings.